At the Center for Creative Youth (CCY), students gain hands-on experience in an advanced, progressive curriculum emphasizing critical thinking, interdisciplinary and multicultural learning and leadership skills. World-class shows, Master classes, RA workshops, field trips, as well as dances, open mic nights and share days throughout the program fill the summer with creative inspiration. 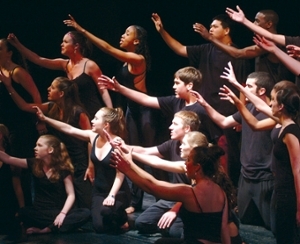 With a 40+ year history of excellence, many students and families have found the program to be “life-changing,” providing focus, validation and motivation to future leaders of the artistic community. Nothing is “sugar-coated” here – expectations are high for students both in the classroom and in the residence – but the staff is dedicated to ensuring that students feel supported, and succeed, in an environment that values individuality. Be sure to check out our CCY Staff as well! Students choose only one concentration when applying to the program. There are a variety of concentrations from which to choose: creative writing, music, musical theater, theater and visual arts. 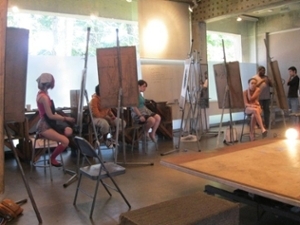 Monday – Friday from 9:30 a.m. – 12:30 p.m. students will have class in these art form concentrations. Every discipline is different and has a specific plan to engage students in hands-on, intense exploration of their art form. Guest artists may be invited in to work with students during these times, or specific field trips will be taken as part of a lesson plan. Students will work both independently and in peer groups on a variety of assignments. Wesleyan University offers an intensive Summer Session in which students can complete a semester-long course in just one month for full college credit. Wesleyan Summer Session is open to rising high school juniors and seniors with the academic qualifications and commitment to meet the challenges and intensity of the program. Specially-selected Summer Session courses can serve as an alternative CCY concentration, to enhance the CCY experience for students interested in college credit. This is an opportunity to learn alongside Wesleyan undergraduates, in a classroom taught by Wesleyan’s top faculty in their fields. To learn more, please visit Wesleyan's PreCollege page here. 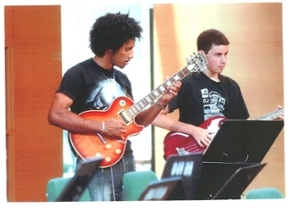 Students choose from a series of elective classes that encourage them to explore art forms outside of their major, or to deepen the study of their chosen art form. These are called the elective intensives. These classes offer a wonderful opportunity for students to broaden their artistic experience and portfolio. They are specific in nature, with an emphasis on multicultural art forms, or topics within an art form not covered in the morning curricula. The elective intensives are attended each weekday from 2:00 p.m. – 4:00 p.m. and run for two weeks, giving each student the opportunity to try two different classes during the four weeks of the program.